Da Capo Lifelong Books, 9780738220161, 272pp. "I'm going for a walk." How often has this phrase been uttered by someone with a heart full of anger or sorrow? Or as an invitation, a precursor to a declaration of love? Our species and its predecessors have been bipedal walkers for at least six million years; by now, we take this seemingly arbitrary motion for granted. Yet how many of us still really walk in our everyday lives? Driven by a combination of a car-centric culture and an insatiable thirst for productivity and efficiency, we're spending more time sedentary and alone than we ever have before. If bipedal walking is truly what makes our species human, as paleoanthropologists claim, what does it mean that we are designing walking right out of our lives? 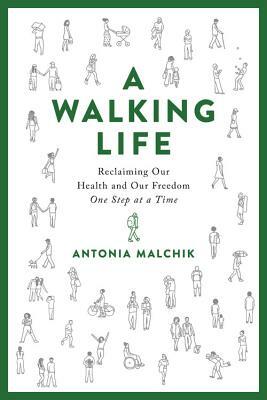 Antonia Malchik asks essential questions at the center of humanity's evolution and social structures: Who gets to walk, and where? How did we lose the right to walk, and what implications does that have for the strength of our communities, the future of democracy, and the pervasive loneliness of individual lives? The loss of walking as an individual and a community act has the potential to destroy our deepest spiritual connections, our democratic society, our neighborhoods, and our freedom. But we can change the course of our mobility. And we need to. Delving into a wealth of science, history, and anecdote -- from our deepest origins as hominins to our first steps as babies, to universal design and social infrastructure, A Walking Life shows exactly how walking is essential, and how deeply reliant our brains and bodies are on this simple pedestrian act -- and how we can reclaim it. Antonia Malchik is the managing editor of STIR Journal and a regular contributor to Full Grown People. Her essays and articles have appeared in Aeon, the Washington Post, the Boston Globe, the Atlantic, BuzzFeed Ideas, and many others. Formerly, she worked as a journalist in Austria and Australia. She lives in Northwest Montana with her family.